Hundreds of thousands of students, lecturers and researchers from Higher Education Institutions and research centers affiliated to the National Research and Education Network (NREN)s of the Democratic Republic of Congo (DRC), Malawi and Zimbabwe now have a glorious opportunity to access high speed and affordable connectivity dedicated to research and education networking following the connection of the NRENs of the three nations to the UbuntuNet regional backbone network under the European Commission co-funded €26.6 million AfricaConnect2 Project. Connection of the three NRENs started in August this year with the activation of a 622 Mbps circuit from Cape Town to Moanda which connected the NREN of the Democratic Republic of Congo (DRC), Eb@le to the UbuntuNet regional backbone. Eb@le’s connection to the UbuntuNet network was immediately followed by the connection of the Malawi Research and Education Network (MAREN) as UbuntuNet Alliance activated an STM 4 (622Mbps) circuit between its existing point of presence (PoP) in Lusaka and the newly established PoP in Blantyre. Joining the list of the newly connected NRENs is the Zimbabwe Academic Research and Education Network (ZARNet) which will be utilising an STM 16 (2.5Gbps) circuit between the UbuntuNet PoP in Lusaka and the newly established PoP in Harare. The ZARNet circuit is expected to be extended from Harare to Cape Town. 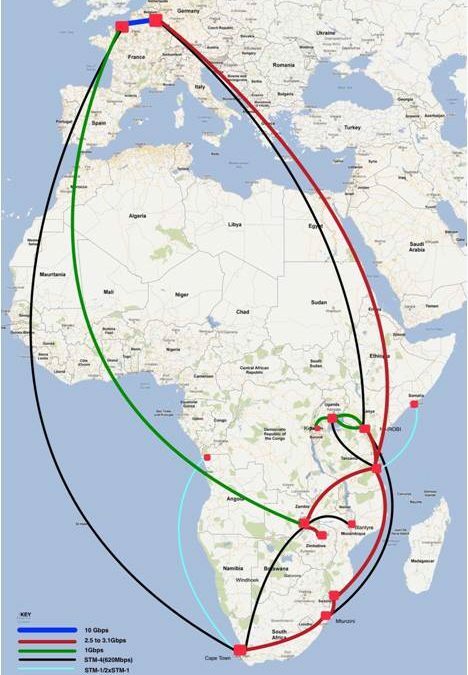 The Connection of the NRENs of Malawi and Zimbabwe was enabled by the activation of a 2.5 Gbps circuit from the UbuntuNet PoP in Dar es Salaam to Lusaka. The circuit is part of a major upgrade of the dry segment of the UbuntuNet backbone network from Dar es Salaam to Cape Town via Lusaka and Harare. Connection of the three NREN Members to the UbuntuNet network brings to 11 the total number of Member NRENs connected to the regional backbone. UbuntuNet Alliance has over the past 10 years connected to its internet network Member NRENs of countries of Kenya, Tanzania, South Africa, Mozambique, Uganda, Zambia, Somalia and Rwanda. UbuntuNet Alliance is the regional Research and Education Networking organisation for Eastern and Southern Africa. It was established in the latter half of 2005 by five established and emerging National Research and Education Networks (NRENs), namely: MAREN (Malawi), MoRENet, (Mozambique), KENET (Kenya), RwEdNet (Rwanda) and TENET (South Africa). The Alliance is registered as a Trust in Malawi and has its secretariat in Lilongwe. UbuntuNet Alliance is driven by a vision of securing affordable high bandwidth connections (gigabits speeds) that interconnect African National Research and Education Networks (NRENs), educators, researchers and students to enable them to effectively participate in global research and education activities. The Alliance operates UbuntuNet, the data communications network that connects member NRENs in the region and connects them to other Regional Research and Education Networks (RRENs) worldwide and to the general internet. AfricaConnect2 is an EU-funded pan-African connectivity project with a total budget of €26.6 million covering a period of 3.5 years. It aims to support the development and consolidation of high-capacity regional internet networks for research and education across Africa and their interconnection with the pan-European GÉANT network, creating a continental gateway for collaborative research and education across and beyond Africa. The project is managed and implemented through two contracts: UbuntuNet Alliance responsible for Eastern and Southern Africa; and GEANT is responsible for West and Central Africa in partnership with WACREN; and North Africa in partnership with ASREN.